There seems to be a misunderstanding about building towers in mission war. This guide will clarify about building towers and about the build points. Thanks to key2chaos of CabalSEA for making this guide. This guide is based from TheTitan’s two TG Guides(Building Guide in Tierra Gloriosa and Tierra Gloriosa Guide). The reason I posted them here is because there seems to be a lot of shouting like ” DO NOT USE POINTS TO BUILD” or “STRICTLY USE ALZ TO BUILD ONLY” in Venus. Seems like people here are kinda confused between BUILDING POINTS and NATION SCORE. POINTS are shown as “P” at the top right of your screen in TG. The outpost your nation control generates POINTS every 3 minutes. Amount differs by the size of the outpost. Nation SCORE are shown as “S” just below the “P”. Blue “S” = your nation score, while Red “S” = your opponent nation score. 1. 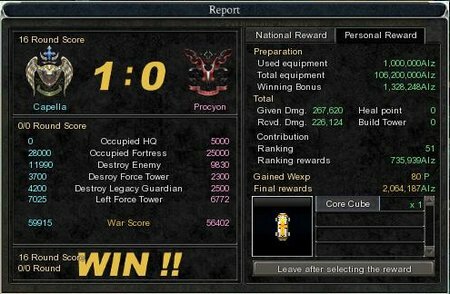 Nation Score NEVER goes down even if someone use points to build tower. Please don’t take my word for it, try yourself and build a tower using BUILDING POINTS and watch if the SCORE of your nation reduce. In fact, Nation Score WILL NEVER go down. Others in CabalSea (liddokun956 and zukedu), have tested this also, and found the same result. 2. Please take a look at the screenshot that shows the scoring system in TG of CABALSEA. Occupied HQ: Destroying the base will give the nation 5K points here. Destroy Enemy: Well, all knows what this stands for. Destroy Legacy Guardian: Also pretty obvious what it means. Left Force Tower: Remaining HP of force tower will also contribute to the score. So it is pretty obvious that, NONE of the above refers to “REMAINING BUILDING POINTS”. Using BUILDING POINTS will NOT lower NATION SCORE. For more in-depth understanding regarding building, please look into the TheTitan’s guide about TG. especially resu/warp tower, as long as your nation has enough POINTS. Buffing and debuffing towers can prove to be very useful if used correctly. In fact, building more towers will actually help your nation win, in many ways. 3. Stop your opponent from building tower using control panel at strategic location. This is because tower have its own “territory”. This means that your final score actually depends on the amount of HP your fixed towers have when the war is over. It is the last row on the score information. So having more fixed tower will actually boost the last row of the scoring, although not by much, but it helps. Having more LEFTOVER BUILDING POINTS won’t add to your NATION SCORE. However, having said all these, BUILDING POINTS should not be spammed either. For example, building 2 resurrection towers at one outpost is usually a bad idea, especially if your country don’t have much BUILDING POINTS left. Another example, building 2 buff / debuff towers nearby are useless too because the effect will not stack. Hope my post help clarify things up in TG. Cheers!